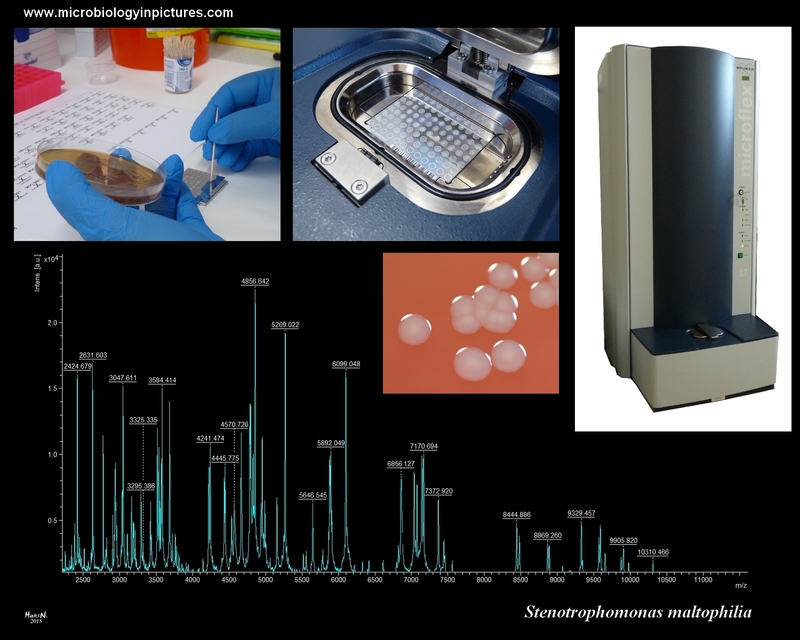 MALDI identification of Stenotrophomonas maltophilia. Currently microorganism are best identified using 16S rRNA and 18S rRNA gene sequencing. However, in resent years martix assisted laser desorption ionization-time of flight mass spectrometry (MALDI-TOF MS) has emerged as a potential tool for microbial identification and diagnosis. During the MALDI-TOF MS process, microbes are identified using either intact cells or cell extracts. The process is rapid, sensitive, and economical in terms of both labor and costs involved. The technology can be used for a number of purposes like, microbial identification and strain typing, epidemiological studies, detection of water- and food-borne pathogens, detection of antibiotic resistance and detection of blood and urinary tract pathogens etc. [Neelja Singhal et al, 2015, p.1]. Mass spectrometry is an analytical technique in which chemical compounds are ionized into charged molecules and ratio of their mass to charge (m/z) is measured. For species level identification of microbes, a typical mass range m/z of 2-20 kDa is used, which represents mainly ribosomal proteins along with a few housekeeping proteins. The characteristic pattern of highly abundant ribosomal proteins, which represent about 60-70% of the dry weight of a microbial cell, in the mass range 2-20 kDa (Murray, 2012) is used to identify a particular microorganism by matching its PMF pattern with the PMF's of the ribosomal proteins contained in an extensive open database [Neelja Singhal et al, 2015, p.2, 3]. MALDI-TOF mass spectrometry: an emerging technology for microbial identification and diagnosis, N. Singhal, M. Kumar, P. K. Kanaujia, J. S. Virdi, Frontiers in Microbiology, 2015.